So many people try to grow grass right up to the trunk of a tree. Or they build a volcano of mulch around the base of the tree where the grass ends and the shade begins. Give it up! Lawn grasses are sun lovers. You do have options, good ones, that will extend the green to the trees without all of the angst and replanting associated with lawn grass. Choose a groundcover suited for dry shade. Make sure you use one that is well behaved. Ivy is a poor choice under trees, since it loves to climb and loves to spread itself around. You will spend too much valuable time trying to keep it off the tree and out of your grass. Remember, too, that your choice does not have to be ground hugging. Your landscape can be a whole lot more interesting with some height under your trees. You can even have flowers in such an inhospitable place. One of my all time favorite groundcovers for shade is the Lenten rose (Helleborus x hybridus). They were named the Perennial Plant of the Year in 2005 by the Perennial Plant Association. Their popularity continues to grow. You can grow Lenten Roses in just about every area of the country, from the heat and humidity of USDA Zone 9 all the way to Zone 3 with good winter snow cover or heavy mulching. They are evergreen, so in milder climates, they continue to look good throughout the year. Plant Lenten roses in rich, well-drained soil. They are fully suited to shady conditions. They just need some watering in the dry days of summer to keep them looking their best. Do as little digging as possible under the trees. Top dress under the trees with a good, well rotted compost and dig each hole separately for each plant to minimize any root disturbance to the tree. If you have tried hostas and discovered that they are deer candy, then replace the hostas with hellebores. Deer and voles leave them alone, making them an almost perfect choice for suburban habitats. So far, no diseases or insects seem to trouble them, not even those voracious devils of shade, slugs and snails. The blossoms appear in late winter or early spring, depending on how long your cold winter days hang around. When the flowering is about to take place, the foliage looks a bit weary from its yearlong display. It is a good idea to cut off the old foliage as soon as the flower buds appear on their stalks above the plant. You will probably also notice a tuft of new foliage at the base of the buds. With the old foliage gone, the flowers will show to best advantage and the pruning will promote the growth of new, blemish-free foliage for the coming year. A caveat: If you are prone to dermatitis, wear gloves when you prune. Some people are allergic to the sap. At the same time as you trim, spread a thin layer of compost under the plants to nourish them and hold moisture. If your plants are happy, they will self-seed with abandon around the mother plant. If you want to grow out your clumps, just let the seedlings mature. You can also move them to another spot of shade. If you are “full up” with Lenten roses, you can very easily pull them up or hoe them out. If you do not want to deal with seedlings at all, cut off the seed heads before they open. This is a last resort since the seed heads are almost as attractive as the flowers themselves. You can find hellebores in many colors, sizes, and price ranges. 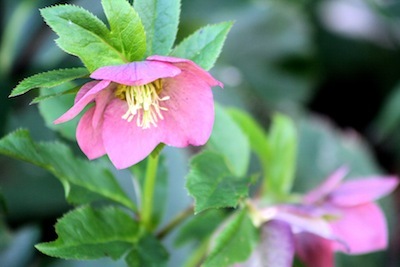 Look for the easiest to grow Lenten Roses at local garden centers and in catalogs.